In Chile, 9 out of 10 women experience street harassment, 97% of whom are between 18 and 34 years old. Men whistle at girls and women as they walk by, make lewd comments in voices loud enough for women to hear but soft enough to avoid creating a scene, and sometimes even touch women—without their permission—on public buses or in other public places where people are in close contact. Lest anyone think these actions are merely expressions of male approval and desire, they reflect a deep-rooted sense of entitlement on the part of men. And the effects of these behaviors tell a very different story. Women routinely give up personal freedoms such as walking alone in parks (as opposed to bring their dogs along for protection); not taking the subway alone; and/or not wear “revealing” clothing that they would otherwise like to sport. Furthermore, in a survey of over 500 girls and women conducted in 2015 by Observatory Against Street Harassment, 15% of respondents reported symptoms of post-traumatic stress disorder; 61.7% said they modify their customary use of public spaces; 55.4% reported feeling increased insecurity; and 49.5% said street harassment lowers their standard of living. Whatever male intentions, their uninvited and unwelcome actions make females in Chile feel vulnerable, and Chilean society has implicitly given men the power to create this dynamic. The good news is Chilean women are increasingly mobilized and are now demanding change. It is not as though Chile is agnostic when it comes to public decorum. In 1874 National Congress enacted Article 373 of the Criminal Code expressly “punishing offenses injurious to public morality and decency.” Other laws throughout the country render public urination and public intoxication illegal. And finally, the same 2015 survey cited above showed that a significant majority of men as well as women support penalties for any form of street harassment (men as well as women were polled in this question). 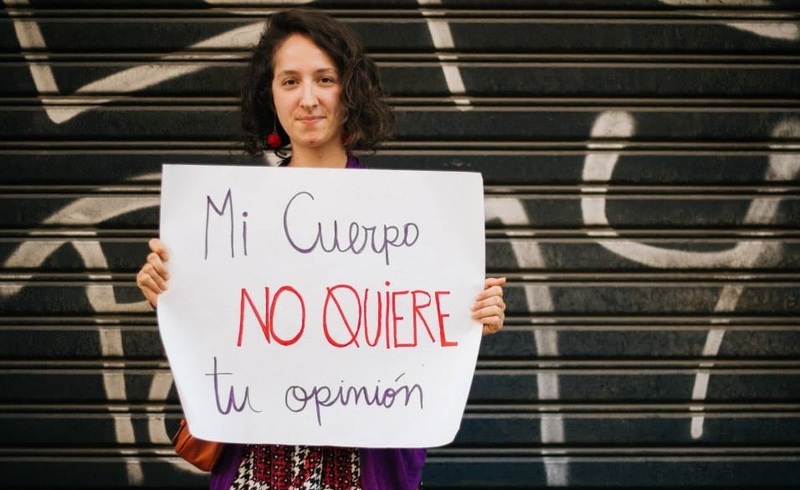 Given the existence of Article 373, fortified by public opinion, and no doubt wanting to add their own voices to #MeToo, feminists in Chile are asking why the law doesn’t apply to verbal and all forms of predation against women. Spearheading the fight to ban street harassment are María Francisca Valenzuela and Camila Bustamante, former sociologists from Universidad de Chile. In 2013 they founded Chile’s Observatory Against Street Harassment, an organization that studies and exposes street harassment as a form of gender violence and fights to illegalize these practices. The Observatory drafted legislation entitled, “Street Respect Law,” that repeals the Affront to Morality and Common Decency Law (the law was very poorly drafted); defines street harassment as non-consentual practices of sexual connotation exercised by an unknown person in public spaces that usually generate discomfort in the victim such as verbal expressions, non-verbal acts, audiovisual records, intimidating acts of sexual connotation with or without physical contact, exhibitionism, persecution, public masturbation;and classifies street harassment as a violent crime. In April 2016 the bill was approved by a unanimous decision in the Chamber of Deputies; if and when it is passed by the Senate, it will become law. The Observatory is also pressing local authorities to sponsor programs to raise awareness of and prevent sexual harassment. This major expansion of women’s rights in Chile is having ripple effects throughout Latin and South America. Women, mostly in their 20s, in Uruguay, Nicaragua, Colombia and Bolivia, have recently created similar observatories in those countries; and in 2014 the Latin American and Caribbean Network Against Street Harassment was born. Today this entity comprises numerous organizations in the region such as Hollaback in The Bahamas, Cuencia and Acción Respeto in Argentina, Chega de FiuFiu in Brazil and Paremos el Acoso Callejero in Peru. Given the often overt sexism in this part of the world, these developments are remarkable. Bit by bit brave women are upending patriarchal Latin and South America. As Julieta Kirkwood, founder of the feminist movement in Chile, once said: “There’s no democracy without feminism”.